Here I am... No real damage done to me or mine. 708am, Sunday -- I find myself violently shaking in my bed. 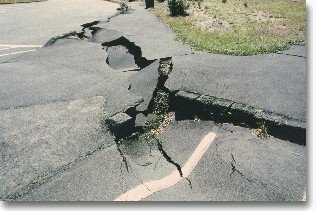 I get up, glance around, grab onto my husband and realize that I had just experienced an earthquake... first time in my life. As I begin to calm down, I hear an EXTREMELY loud rumbling and start to see the house begin to shake... again. My heart hadn't even slowed its pace from the first quake and round two was already upon us. As I said -- no damage done to me or mine. Five minutes after the quake, Hawaiian Electric cut the power to the ENTIRE main island of O'ahu... which is the one I reside on. It happened to be THEEE hottest day of the year. Oddly, folks on the island of Hawai'i, closest to the epicenter of the quake went but five minutes WITHOUT power and it was back on. One is led to question WHY the island of O'ahu went without electric for over 12 hours... for some even LONGER. If that wasn't strange enough, I remember early this past summer, HECO orchestrated an INTENTIONAL black out to over 35,000 customers in the urban areas of Honolulu for over 4 hours. I remember the spokesperson for HECO warning consumers to expect more. I could go into greater detail about the theories floating around from some of my recent reading material and lectures I've attended. There's peak oil -- you can read Crossing the Rubicon by Michael Ruppert. Excellent read and TOTALLY believable. He ties in the 9/11 theories of government involvement in the orchestrating of the collapse of the three towers in NYC. At the exact OPPOSITE end of peak-oil theory is the "Enery Non-Crisis". I attended a recent lecture featuring Lindsey Williams, author of "The Energy Non Crisis". He speaks of government manipulation of fuel prices that will make the energy crisis of the 70's look like a walk in the park. He expects the price of fuel to rise beyond $7/gallon AFTER the November elections. After being WITHOUT the modern convenience of electric for nearly 24 hours, I was instantly reminded of EVERYTHING I had read and listened in on. Though our family was TOTALLY prepared for such an event, I was still very agitated at the very real idea of a FORCED blackout... as the HECO spokesman had alluded to, earlier in the summer. I feel like this whole entire country is one huge PETRIE dish. We are the controlled environment. We are force-fed network news to sway general opinion. Events like 9/11... stimuli! Katrina... stimuli! Iraq... stimuli! Fans of the TV series, The Lost, can probably relate to this idea I'm feeling. The weather -- It was eeerily still... like the calm before a HUGE storm. It was weird and I totally neglected taking pictures of the ocean and the skies. I was way busy battling the heat and humidity and battling the thoughts of being manipulated by the powers that be -- the secret combinations. The end thought of this post, The Aftermath: My mind is as sharp as ever, my soul not yet wounded by a decaying society, my heart -- hopeful! I'm glad to hear that you and your family are safe and didn't sustain any damage. My friend and her husband live in Ewa Beach and I'm wondering how they're doing. I need to remember how many time zones they are behind mine before I call them. Plus, I hope their power and phones are working. I'm just glad you and the family are okay. I was getting worried when we didn't 'hear' from you. I'm glad you and your family are alright too.